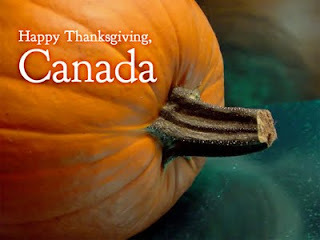 Everyone at CanadaVet.com whould like to wish our customers a very happy Thanksgiving day! The history of Thanksgiving in Canada goes back to an English explorer, Martin Frobisher, who had been trying to find a northern passage to China. He did not succeed but he did establish a settlement in Northern America. In the year 1578, he held a formal ceremony, in what is now called Newfoundland, to give thanks for surviving the long journey. This is considered the first Canadian Thanksgiving. Other settlers arrived and continued these ceremonies. He was later knighted and had an inlet of the Atlantic Ocean in northern Canada named after him - Frobisher Bay. At the same time, French settlers, having crossed the ocean and arrived in Canada with explorer Samuel de Champlain, also held huge feasts of thanks. They even formed 'The Order of Good Cheer' and gladly shared their food with their Indian neighbours. During the American Revolution, Americans who remained loyal to England moved to Canada where they brought the customs and practices of the American Thanksgiving to Canada. There are many similarities between the two Thanksgivings such as the cornucopia and the pumpkin pie. Eventually in 1879, Parliament declared November 6th a day of Thanksgiving and a national holiday. Over the years many dates were used for Thanksgiving, the most popular was the 3rd Monday in October. After World War I, both Armistice Day and Thanksgiving were celebrated on the Monday of the week in which November 11th occurred. Ten years later, in 1931, the two days became separate holidays and Armistice Day was renamed Remembrance Day. "A Day of General Thanksgiving to Almighty God for the bountiful harvest with which Canada has been blessed ... to be observed on the 2nd Monday in October. CanadaVet.com call centre staff will be working on Canadian Thanksgiving.